This large home has fantastic views from upstairs and downstairs. The master bedroom opens onto deck over looking the sea. Located right in town, but on a quiet street, everything is within walking distance, including cafes, art galleries, the beach, and the new park area with skate park, basketball and bmx track. Please note the house is not available to book from November-April. All bedrooms have oil heaters in the rooms, though the wood fire does heat the house nicely. The lounge and dining area open onto the front deck looking out to the harbour and Karioi mountain, perfect to catch the westcoast sunsets. The house is fully equipped with all you need for a great stay including all bed linen, full kitchen, log fire (with plenty of wood), bbq, 42" flatscreen TV (sorry no tv signal, but large DVD collection), DVD player (and DVDs), stereo. And you have parking right in front of the house on the coastal reserve. There is one large bathroom with two showers. Also two separate toilets in their own rooms, one upstairs, one down. This house is adjacent to our small backpackers hostel, so as our guest you have free use of the sauna, spa pool, bikes, kayaks, and stand up paddle boards. We also have a full range of surf gear available for hire. Kayaks can be launched off the front lawn, surf lessons can be organised upon request. The infrared sauna or hot spa pool are great for evening relaxation! Raglan's harbour has several lovely swimming beaches, all within minutes walk of the house. You can walk for 6 km along the sandy beach which starts right around the corner from the house. 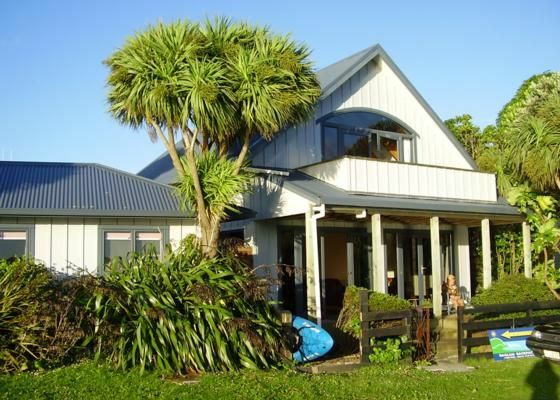 The Water Front house is a great base from which to explore Raglan, and a wonderful house to relax in. We take a damage deposit, which is refundable if the house is left in a clean and tidy condition (ie dishes done, rubbish in bins, but you don't have to clean the bathrooms or re-make beds! ), and no damage to the property or fixtures. We're a couple in our 40s, we love the beach and to surf and paddle board. And we absolutely love Raglan and hope you will too! Located in a quiet street, yet only 1 mins walk from Raglan town centre, cafes, and swimming beach. Come next door and use our kayaks, sauna, hot tub and paddle boards. Free kayaks and SUP's. Surfboards and wetsuits available for hire. Such a great place to get away, large and spacious house, with great outdoor decks to enjoy the sunshine and views. Awesome facilities and free use of paddle boards, kayaks and spa. Will definitely be returning here in the future! Fantastic place to stay. House was worm and cosy, perfect location and well euipped with everything. We had a lovely few days staying at Waterfront Holiday House. Everything was easy to use, and the location close to the harbour, town and backpackers was superb. Would return in a heartbeat. We had a great stay at the Bach - great location and facilities. Wonderfully warm and the house had everything we needed. We loved the spa and the kids loved scootering over the footbridge to the skate parks. Would stay again.